Few American phenomena are more evocative of time, place, and culture than the drive-in theater. From its origins in the Great Depression, through its peak in the 1950s and 1960s and ultimately its slow demise in the 1980s, the drive-in holds a unique place in the country's collective past. 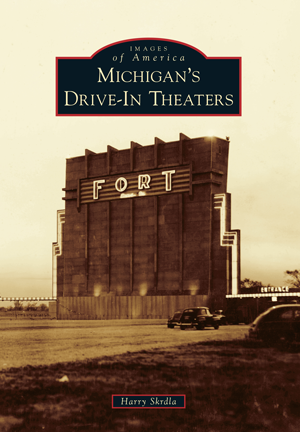 Michigan's drive-ins were a reflection of this time and place, ranging from tiny rural 200-car "ozoners" to sprawling 2,500-car behemoths that were masterpieces of showmanship, boasting not only movies and food, but playgrounds, pony rides, merry-go-rounds, and even roving window washers. Photographs culled from dozens of sources, including the Grand Rapids Public Library, Goodrich Theaters, Bacon Memorial Library, Portage Library, Celebration Cinemas, Community Theatres, Lakeshore Museum Center, American Classic Images, and many others serve to recall the history of Michigan drive-ins. From the tiniest local theater to the mammoth metropolitan, multiscreen giants, author Harry Skrdla uses these images to remind readers what it was like to go to the drive-in. Skrdla is senior engineer at the historic Fox Theatre in Detroit, an architectural preservation consultant, and author of Ghostly Ruins: America's Forgotten Architecture.